Befitting a great film architect, Robert Wise gave good prologue. The beauty of a prologue well executed is in more than setting a mood or tone or offering simple backstory information. It’s in the way it blueprints the film to follow, providing a foundation from which the drama can build and an outline later events will flesh out. The tighter the blueprint, the more easily we can map passages from room to room (as scene to scene), correspondences between locations, relationships between planes, while at the same time getting a sense of the structure as a whole. The more we study these patterns and layouts, the more clearly we can read the trademarks of the designer no matter the diversity of his works. And the more we recognize these appointments, the more readily we sense the intelligence behind their construction, the genius in the details. Befitting a great film architect, Robert Wise gave good prologue. Often, these were the most meticulously thought-out and executed portions of his films, even when the balance of the work turned out unsteady or flawed. From the concentration-camp opening of House on Telegraph Hill, whose identity switch laid the foundation for the unspooling drama’s questions of personality and authenticity, to the pre-credits obliteration of the submarine in Run Silent Run Deep, establishing the context for the film-long reassembly of its commander’s psyche; from the POV death of the financier whose Executive Suite provides the stage for a playing out of the meaning behind his passing, to the narrated history of The Haunting’s similarly monolithic Hill House and its replaying of the death of the patriarch; from the credits-sequence Set-Up boxing match in which an anonymous pugilist hits the canvas, casting the rest of the picture as a dream in the mind of all punch-drunk fighters, to the camera’s sweep across the Alpine landscape in The Sound of Music as though searching for a missing element till none other than Julie Andrews emerges from out of those hills to extol their restorative effects, the impression of deliberation is most vivid, the presence of the author most palpable. For a director as eclectic in form and subject as was Wise – whose work famously encompassed horror (The Body Snatcher), war (The Desert Rats), noir (The Captive City), science fiction (Star Trek), historical spectacle (Helen of Troy), musicals (Rooftops), topical drama (I Want to Live! 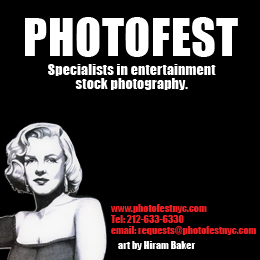 ), “women’s” film (Three Secrets), the biopic (Star!) and westerns (Tribute to a Bad Man) – it can be easy to miss the correlations within their various exteriors. But for one whose greatest strength was structure and whose style notoriously changed to suit the needs of his story, we can look to the foundational elements of his films to discover the unifying principles behind his incredibly sturdy body of work. Beyond his facility with a prologue, Wise knew how to wrap up a feature, too. Take Sound of Music, whose story comes full circle to lead the escaping Von Trapp family, under the guidance of that impulsive, implacable “problem” child of nature, Maria, back to her opening landscape. Such bookending was commonplace in Wise, as in Haunting’s epilogue paraphrasing of psychic investigator John Markway’s introductory statement – a device borrowed from source novelist Shirley Jackson and blueprinted in journalist Ed Montgomery’s identical opening and closing testimonial from I Want to Live! (both films scripted by Nelson Gidding). There’s a determinism about the Wise universe partly abetted by such structuring devices as well as by the factual basis of so many of his films – from the biopics and historical dramas down to the actual newsreel footage to which The Hindenburg leads – proscribing any ending other than the inevitable; Born to Kill, indeed. All conclusions are encoded in their beginnings, each character and situation circumscribed like the ropes around the ring Stoker Thompson fights his life through in the film that betrays this world-view from its title on down, The Set-Up. Wise recognized his talent for construction (“Planning!” he enthused on his DVD commentary to The Day the Earth Stood Still, “Planning! Laying out. Organizing. Getting everything ready, everything set”) and applied that self-awareness to his films, gravitating toward properties where this forethought was a motif of the works themselves. Think of the scheme to bring down the Hindenburg and the strategies and maneuvers of his various war films; the heist at the heart of Odds Against Tomorrow; the carefully selected team in that film as well as The Haunting and Andromeda Strain; consider, too, the glitches that threatened or outright ruined each plan. What brings this failure about is the real subject of his work: the militarism that introduced the elementary Strain to the technological installation in that film, the classism of his first full directorial credit, Mademoiselle Fifi (as well as later West Side Story), organized crime in The Set-Up and The Captive City, greed in Telegraph, jealousy in Helen, madness in Haunting, racism in Odds. Of course, the most famous architect was Daedalus, whose name meant “cunning worker” and whose labyrinth was built to house the divided offspring of his queen’s affair with a bull. Most Wises are mazes in themselves, at the center of which resides some ambiguity that must be resolved before the complex can be seen in overview, from the enigma at the heart of Hill House to the Strain whose mutability confounds the scientists tasked to analyze it much the same way the director’s body of work befuddles his critics. Each of these edifices has a “pressure cooker” at its core (as Markway described the nursery in Haunting) or “nerve center” (as Wise himself characterized the research installation in the trailer to Strain, built by its own Daedalean leader, Jeremy Stone, and including its own radioactive core), whether the boardroom of Suite or the engine room of Pebbles, Run Silent’s Area 7 war zone, or Story’s New York City; in Live! it’s the gas chamber toward which the whole film shudders along. Possibly what gave Wise his sense of both form and malfunction has its roots in his own professional prologue. Cutting his teeth in the editing room at RKO Studios, Wise influenced the shape and pacing of films by producers and directors the likes of Val Lewton, Dorothy Arzner, and William Dieterle. His work trimming and reshooting parts of The Magnificent Ambersons, though, while likely costing him a position in the auteurist pantheon, won him the chance at his first on-screen directing credit – for another troubled production, Lewton’s Curse of the Cat People. After losing the reins of Run Silent to producer-star Burt Lancaster, Wise began producing his own features, as he did for the better part of his career after. Yet it was almost certainly his first experience working with Orson Welles, on Citizen Kane, that taught him the mechanics of an elaborate first few minutes and the transcendent dynamic it can have over the film to follow. And it was this apprenticeship that would inform one of his most tightly structured prologues 35 years later in the reincarnation drama Audrey Rose, as well as that film’s subtext of carrying on in the aftermath of a transformative life experience with a charismatic and destructive visionary. Rose’s setup is simple: Through thrashing wipers, we see a car ahead cross the median and head in our direction. It strikes our vehicle; the windshield shatters; we tumble down an embankment and ignite. Yet in that compact 51 seconds and its transition to the present are all of the images and elements that will inform the 95 minutes to follow. From the first shot we understand that the film will be about grief. The unexpected. A life derailed. The fragile barrier between our sense of security and the outside world. The similar fragility of civilization in the face of nature. Above all else, the absence of power to stop what is going to happen. The film’s suddenly discontinuous editing on impact reflects a world robbed of connective tissue, the camera’s end-over-end tumbling the topsy-turvy result of this break from a harmonious path. We never see either driver’s face, only glimpse the passenger whose soul will invest the rest of the drama. 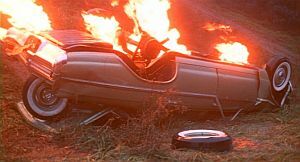 In fact, the absence (“Daddy!”) of the one who should have been there to maneuver the car or rescue the child inside its incendiary womb is what informs the entire episode as well as those events the accident will draw into its wake. 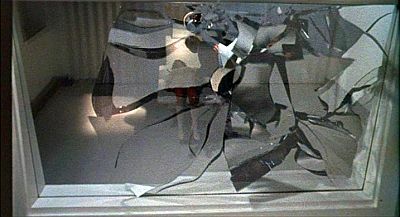 In that opening image also is the motif that will provide the film the tissue missing in its characters’ world, that of the car’s window pane. 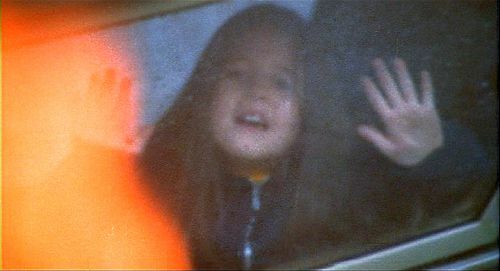 This glass, as other dividers, appears throughout the film in the bonnet of an umbrella, the aquarium in a girl’s room, a supermarket surveillance mirror, the girl’s classroom window, the frosted panes that burn her hands and the Japanese screens her mother puts up to protect her from them, the curtains she tears through on a somnambulant rampage, the window frustrating the Mother Superior at the convent school to which she’s been relocated and the mirror she plays “pretend” before – not to mention the camera lens itself, through which all are mediated – till finally Wise fills the screen with pane after pane in the virtuoso interrogation sequence that climaxes the picture in a hospital observation theater. There are additional dividers real and figurative in the membrane between planes of existence and the worldviews various characters uphold or breach, and the hymen these all recall in a drama ultimately concerned with one sheltered woman and her loss of innocence in a time of upheaval for all women. And so the thresholds much of the drama takes place upon, from the doorway a mother and daughter discuss a schoolmate’s first period in to the girl’s two birthdays, and the stairway her mother and father argue on and doorway he and another scuffle in when the latter invades their home to abduct their child Rumpelstiltskin-like. (Interestingly, there’s a similar short-term abduction toward the end of Telegraph, another story dealing with a sort of reincarnation.) In all cases these passages reinforce the story’s insistence on the permeability of frontiers, to the revelation of the characters involved. Such crashes were no novelty in Wise, either. Rose’s echoes, first off, the submarine demolition at the beginning of Silent, itself a recollection of the shipwreck early on in Helen; Hindenburg, of course, climaxes with that historic conflagration; the pestilence of Strain originates in the falling to earth of a space capsule; Telegraph features a woman wrecking her vehicle midway through; Haunting begins with a carriage overturning and ends with its possessed lead ramming her car into a tree. 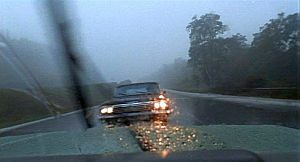 When the driver of the car that runs Rose’s title heroine off the road materializes in the middle of her film, she’s a near-lookalike for Haunting’s Julie Harris, and goes so far as to echo Harris’s penultimate remark on how the steering wheel “twisted in my hand.” It’s as though the latter had in fact survived her accident (or been reborn) and been tooling around the 14 years between films waiting for her moment to testify against the forces that had left her in her wheelchair, trapped in a similar vehicle to that which ruined her life. Given the proliferation of women especially in these crashing vehicles, as well as the fact that only females are involved in the collision here, it’s easy to recognize the inference for all of their gender, as captives in a machine not their own and headed for destruction. When Wise cuts from the burning car’s Pennsylvania license plate to New York City bus tags, it takes a quick eye to realize that 11 years have passed from the opening tragedy to now. So when we’re introduced to a new family, we carry an unconscious association between them and the mother and daughter just witnessed, as well as the father left behind. The trio now shown bicycling around Central Park in vignettes of bland togetherness as the titles roll are the Templetons – ad exec Bill, stay-at-home wife Janice, and their 11-year-old daughter Ivy. Shadowing them almost imperceptibly is another figure who will act as a vehicle of his own coming from out of nowhere to disrupt their complacency, Elliott Hoover, British father of the title child in the car who he believes has been reincarnated in Ivy’s body. His obsession with her will lead to trauma and courtroom drama, yet as Janice comes to know him and allow him to come between herself and Bill (much the same way Helen Benson’s attraction to the similarly exotic alien Other Klaatu in Still precipitates her rejection of her suitor there), he will emerge as more a notion than a real person, arising from the back of her mind to lead her from the subordinate and a servitude to the material to the next stage in her personal development. A few Wises are themselves undone by a similarly destabilizing agent, or structural flaw. Whether showboating actors (Paul Newman in Somebody Up There Likes Me, Susan Hayward in Live! ), insufficient lead time (Star Trek) or simple heft (Pebbles’ unwieldy subplots, Star!’s three-hour roadshow bloat), his work, like his characters, is subject to miscalculation. 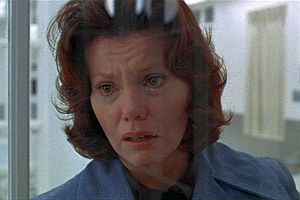 Rose’s primary failing is in its script by source-novelist Frank DeFelitta, whose schematic characterizations can’t be put over convincingly by actors even the caliber of a Marsha Mason. His employment of a lengthy and illogical courtroom episode intended to confirm the reality of reincarnation threatens to topple the feature under the weight of improbability until Wise’s climactic set-piece returns the narrative to steady ground. All the same, Wise shares some of the responsibility, for in his avoidance of the vulgar pyrotechnics of the recent, not dissimilar Exorcist in favor of the suggestiveness of his mentor Lewton, he leaves the film without a personality of its own, ironically enough. Yet it’s in the meticulousness of that climactic examination, as in the prologue, where he is most in his element (or, in the parlance of The Set-Up, “in the ring”), saving the entire enterprise from ruination. Though the courtroom sequence does serve as a document of a shift in consciousness, in the end it’s little more than a prop for the final examination in which Ivy is hypnotically regressed in hopes of debunking the defense’s assertion of reincarnation, thus Hoover’s claim to co-parenthood. 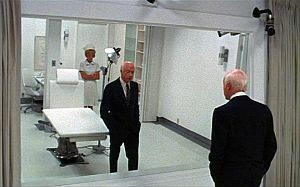 The experiment commences against Jan and Hoover’s objections, requiring the relocation of the court to a hospital observation theater presided over by an admittedly inexperienced in the field psychiatrist. The proliferation of frames here to Lady from Shanghai proportions are meant to reiterate, as in that film, the accumulation of perspectives generated by the preceding drama. Given the similarities to The Haunting’s entire premise of a research team isolating itself to study another supernaturally-associated woman – as to the closing procedure in Live! and the tragedies that ensue in both – the operation should not be viewed optimistically. On one side of a one-way mirror, the doctor talks Ivy back through childhood experiences, while on the other side the jury, complemented with the judge, prosecution, and defense, watch. The set is reminiscent of other Wise chambers from Snatcher and Strain’s operating theaters to Klaatu’s climactic “surgery” and the similar, actual prosceniums of Star! and Music. It recalls, also, the post-newsreel screening room of Kane while simultaneously invoking the final, real proscenium of the cinema screen, the company gathered to witness the proceedings there akin to the audience and critics convened to watch the playing out of a perhaps privileged drama reflecting our own collective needs and desires. 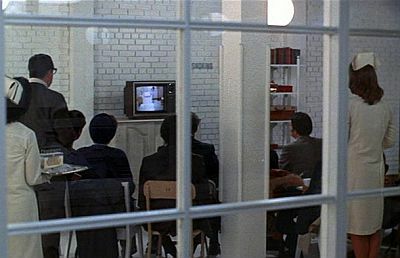 What to make, then, of the fact that Jan is left to view the proceedings through an isolated window onto a waiting room where the media and other onlookers watch on closed-circuit TV? The effect of so many mediating panels is to make the public spectacle private: so much objectivity gets to seeming like subjectivity, after a point. And it probably is subjective experience, after all: As Ivy is led back through various stages of life to “before you were born” (the repetition of the phrase sounding less like hypnosis and more like brainwashing), the idea of a consciousness before her own becomes suggestive of the social conditioning that goes into the making of a woman before she has any awareness of herself as such. 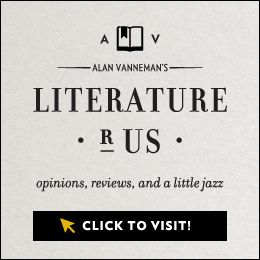 The containment within this chamber of a 13-year-old girl and her 6-year-old former self accords with other multigenerational Wisean “pressure cookers” from the Haunting nursery where a young girl lap-dissolve ages to a crone, to Strain’s surgery holding both infant and cantankerous coot at once. When the psychiatrist begins insisting “Who are you?” it’s like an echo chamber within a self-interrogating mind. And when the first word out of Audrey/Ivy’s mouth in response is “Mommy,” it’s understood: that mind is Jan’s, and the life in jeopardy is her own. When all goes terribly wrong (compare her situation to the Mother Superior’s in an earlier sequence, watching helplessly from her window as Ivy crawls her way into a bonfire), it’s clear at last that what we are witnessing is a refraction of the same perspective as Mrs. Hoover’s in the very beginning, those compounding separations a demonstration of her removal from any kind of agency in the face of impending doom. There’s supposed to be a sense of history righting itself when Hoover – responding to the psychiatrist’s mistaken pleas for Ivy, rather than dead Audrey, to awaken from her imprisonment in the burning vehicle – breaks the glass as he wished he had been there to do in the first place. Yet, as with many Wises, we are left in the end with the unease of knowing nothing has been settled entirely. Hoover’s reassurances to the shell-shocked Jan on seeing her daughter dead in his arms that “It’s all right, her soul has been set free” is incredible, his disastrous effort to determine the girl’s fate recalling Markway’s Haunting similar as well as Ed Montgomery’s in Live! 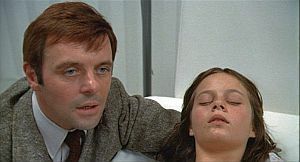 His repetitions here echo the psychiatrists’ minutes earlier, lending ambiguity to the film’s coda in which Jan writes to express her gratitude for his “doing all you must for the peace of our daughter.” After all he has put her through and for so devastating a reward, one has to wonder if she also has not been brainwashed into believing the man’s mystical folly. Comparing this coda to the film’s prologue deepens this sense. Jan’s address to Hoover echoes Audrey’s situation at the car window, both beseeching the help of an absent father. In its similarity to Strain’s conclusion, where Wildfire architect Dr. Stone confronts a Senatorial inquest into the near-disaster over which he’s presided, the scene plays out also as a colloquy between Jan and her own conscience, her hopes for her daughter’s – that is, the next generation’s – next incarnation an admission that the last one was a washout and a flub. If the closing quote from the Bhagavad-Gita regarding the soul’s immortality is hard to swallow, it may be because Wise himself, for most of his career the cinematic pragmatist, couldn’t convince himself, either. As a dry run for Trek’s epic metaphysics, however, it does show the director at a threshold of his own, indicating his next cinematic incarnation. It’s no stretch imagining Wise asking himself this at least at some point in his career. For, as the producer-director-editor and businessman-artist-architect in front of as well as behind the glass who saw the outcome in the prologue because he knew the one was contained in the other and who set up these mirrors and panes in order to break through them as Hoover does in the end, the late-career revelation of himself as more than mere facilitator must have frustrated him in the face of naysayers the likes of both Andrew Sarris and Pauline Kael, who agreed on little but that Wise was a hack. 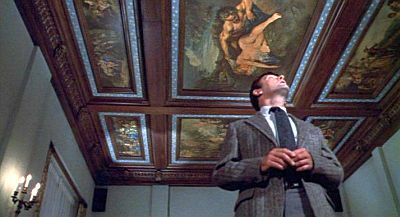 Yet for someone so fully in control of the blueprinting, structuring, and execution of his work – work demonstrating a commanding consistency in imagery, subject matter, characterization, theme, and design (if not style) across decades – there can be no other term than auteur. No matter whether he was wise even to his own artistry, his films were an active demonstration that there is genius in the construction, and for the reflective viewer, that construction is enough.